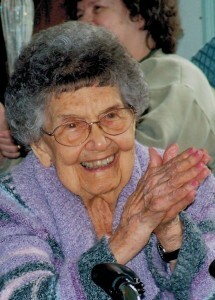 Vesta L. Moore, 95, a resident of the Watson Memorial Home, Warren, PA. and formerly of Sheffield, PA. died Sunday, April 22, 2012 at Warren General Hospital after an illness of the past week. She was born June 15, 1916 in Renova, PA. to the late Ira Joseph and Mabel Madeline Delaney McKinnon. Vest was a resident of Warren Co. for the past 20 years. She was a 1934 graduate of Warren High School and was employed with the former New Process Company and former Pennsylvania Bank and Trust Company where she retired as Head Bank Teller after 20 years service. She was a member of the First United Methodist Church of Warren, PA. and a former member of the Sheffield United Methodist Church where she was a member of their bible study and had served as coordinator of the church vacation bible school. She was a member of the Sheffield Senior Center. Vesta along with Ann Curtin, started the Sheffield Well Baby Clinic. She had served as coordinator of the Sheffield Red Cross Bloodmobile and the Warren County Girl Scouts. She was an avid bowler, golfer, cook, accomplished pianist and organist, and currently played at the Watson Home. She also enjoyed flower gardening. She is fondly remembered by those who loved her as being a woman who loved being a wife, mother, grandmother, great grandmother and great great grandmother. She is survived by her two children – Carolyn A. McFarland of Shippenville, PA., Richard D. “Rick” Moore and wife, Janelle C. of Warren, PA., 2 Sisters – Patty Paul and Kathy (Bill) Miller all of Cortland, Ohio, 1 Sister-in-law, Doris Moore of Sheffield, PA., 6 Grandchildren – Debra Nosel (Matt), Darren Moore (Dawn) all of Warren, PA., Richard T. McFarland of New York City, NY., Michael L. Grosch (Tom) of Austin, TX., Melissa K. Schmader (Dan) of Lucinda, PA., Carole Walter (Ron) of Siegel, PA., 8 Great Grandchildren, 3 Great Great Grandchildren, several nieces and nephews also survive. In addition to her parents, she was preceded in death by her husband, Richard W. Moore who she married September 3, 1938 in Ridgway, PA.
My sympathy to Carolyn and Rick and their families. So sorry Carolyn & Rick. You were lucky to have her for so long.